It looks like Milo has gone missing. He’s done a runner from the area around Oakfield Road, Balsall Heath. Apparently he will answer to his name, which sounds a bit unlikely but worth a shot. He’s only been missing since the 21st December, so the trail is very much alive. So get out there and check your sheds, or even take a close look at that cat you might have “taken in” over the last couple of days. His owners really want him back and this isn’t the weather for a cat to be outside mucking about in. If you see him, then his owners number is there, alternatively email us on emergency@meowseley.co.uk or even leave a message in the comments below. 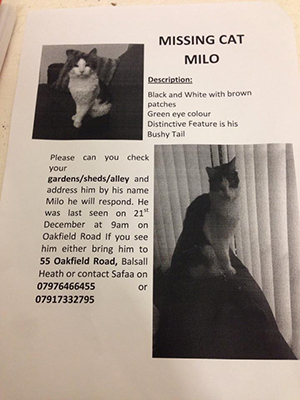 Good luck, let’s being Milo home.